Are you in need of a demolition company with experienced workers to take care of your commercial building? Then you've got to the right place! Demolition in Atlanta ins't as easy as it sounds, especially for the building owner. Many times the entire structure doesn't need to come down but rather a smaller part of it. Demolishing commercial buildings partially and holistically is precisely what we do. No matter if you want to get rid of a single wall, or all floors, we will make sure that by the end of our involvement it will have come to the ground into pieces of debris. Our workers have had the appropriate training required while also holding lots of years of experience under their belts. The excavators and machinery used are of latest technology and always serviced - prepared for a new demolition site. Our company will stand with you every step of the way: from the free consultation to the very last removal of debris. Depending on the type of services you need, we can tear down the building, clean up the remains and even perform land leveling. We cover everything and do a darn good job at offering the best deal you can possibly get in Georgia! The process is simple: you call us, we come out and give a free inspection and estimate of the project. Once we have all the permits in place, we move in and are ready for action! We will be informing you of the progress achieved along the way, as well as reporting to you about anything work mentioning. The projects will run smoother than you would think with all participants being happy with the end result. 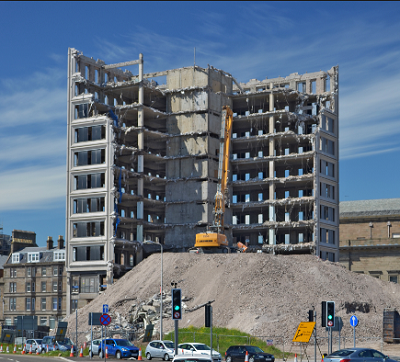 If you have a couple of buildings you need demolished and are thinking of doing both at around the same time period, make sure you let us know. We probably will be able to give you a greater deal on such projects. The larger the projects, the greater the deal we can get you. Also if you are going to be using us for the debris cleanup also, we will make sure you get a lower price. The more work you need done from us, the cheaper it will be for you. Hiring the same demolition contractor for one property makes more sense, as there is full knowledge of the situation and no need for stalled communication. So we will be in and out of your demolition site in no time, getting it all set for you to start the new construction work at that location. 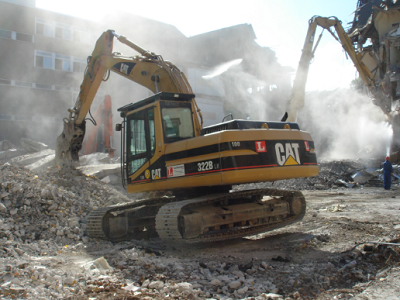 When it comes to the demolition approach, know that you have a variety of options. Of course we will always give you our input, but if you have some preference in the way you want to tear down your commercial building, let us know. Usually for smaller structures we will use our heavy machinery along with labor going in and taking care of details (like internal guttering.) 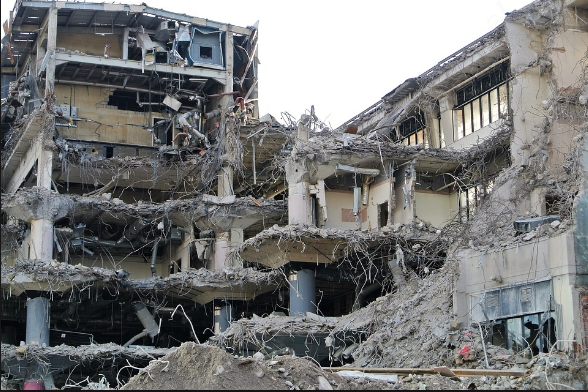 Implosive demolition can take place for larger buildings (multiple story buildings) but after all permits are received and we are all clear with local authorities and government. If you want wrecking demolition done, because that is also included in the more "aggressive" types of demolition, we will need to make sure we are clear with neighbors too. Of course, not always do we need to make a lot of noise and create deconstruction panic. We are experts in surgical and precise deconstruction work which takes away the buildings and inner structures, piece by piece. So the technology available to us today, really allows us to go in and perform demolition in a very surgical and safe way. No dynamite going off or wrecking balls swinging in the air: that is fine if that's what we need to do. But so many projects could be taken care of in a more discrete and effective way. With our convertible high reach excavators we are able to take pieces away of the building, without damaging other structures. Even if you have a couple buildings that are side by side, we are able to just take away your building, leaving the neighboring one harmless. So regardless of what type of demolition work we do, the bottom line is: no damage will be done to nearby properties so you won't have an extra headache to worry about. 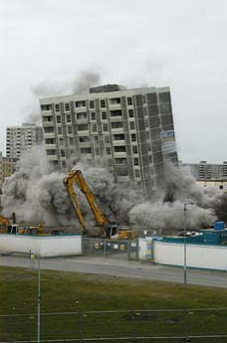 We are extremely careful and aware of the risks involved during a demolition project. Most of the times, demolition for a commercial building means something else will be put in its place. Rarely does someone demolish a ten or twenty story building just to have an empty parking lot. So that means that there are completion time frames that need to be met, budgets that need to be honored and a very solid foundation needs to be set for the new building. If at the end of a demolition, you still have pieces of debris on the ground, it makes it tough for the general contractor to come in and get things started in a short period of time. Because then he would need to bring in separate excavators to take all these pieces off the property etc. So we guarantee you, that by the time we leave the premises of the property, everything will have been picked up, allowing you to focus on construction instead of deconstruction. Put your trust in the greatest demolition contractors in Atlanta, GA.